Newspaper clipping from the Washington D.C. Star. 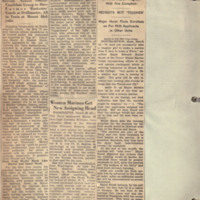 Full article, with image and caption, from clipping visible in Item #1476 about the formation of the first women band in the Marines. 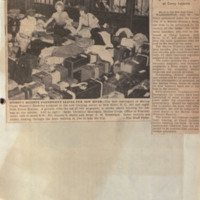 Article published on July 15, 1943. 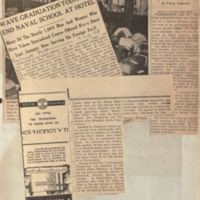 Newspaper clippings from the Washington D.C. Star (July 15, 1943) and the Frederick Post (August 19, 1943) about Marines forming the first woman band and the WAVES graduation. 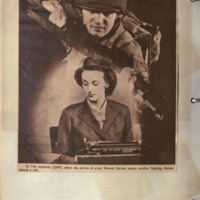 Photograph clipped from a newspaper of a Marine with a female typist in the foreground. Caption reads "In the Marine Corps, where the service of every Woman Marine means another fighting Marine behind a rifle." Two clipped newspaper articles about women training for the WAVES, from the Star (June 6, 1943) and the New York Times (June 17, 1943). 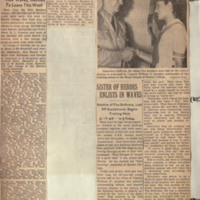 Page of clippings featuring three newspaper articles about women marines.